Warm and welcoming: even the resident eland makes you feel welcome! Saruni is a small, luxurious yet homely camp in Mara North conservancy. Excellent game, welcoming staff - we love it. Nestled into the hills of northern Mara overlooking a gorge populated by elephant and buffalo, Saruni has the wide open game plains to the south and forest to the north. Staying here you'll have the opportunity to walk in lush forest looking for colobus and Sykes monkeys, as well as following the big game on the plains below. The common dining area and is a mixture of old-fashioned Africa and modern design. Sitting in front of the huge fireplace you'll chat over the day's events with fellow guests. Meals are served dinner party style with the cuisine having a strong Italian influence while also including local ingredients and dishes. Alternatively meals can be taken in the bush, or by candlelight o­n your cottage veranda. There is an extensive collection of books in the library which is a perfect spot to rest and relax. The Maasai Wellbeing Space offers a range of massages and treatments using local plant products. Fully-open Land Rovers specially designed for maximum visibility are used during game drives, on which you'll have the services of both a professional guide and a tracker. Foot safaris explore both the Masai Mara plains and the mountains and hills that surround Saruni incorporating local Maasai knowledge. There is also an opportunity to visit Maasai villages and witness their daily lives. Open: Saruni Mara is open all year. Location: Saruni Mara is located in the private Mara North Conservancy just outside the Masai Mara National Reserve. It is in a remote valley with views of the vast Mara plains. The lodge is a 45-minute drive from Ngerende airstrip and 1 hour from Mara North airstrip. The lodge is about a 5 hour drive from Nairobi. The lodge is owned by an Italian and has been designed by a Kenyan architect. Rooms: There are 5 guest cottages and 1 family villa with a double and a twin room. The lodge accommodates a maximum of 14 guests in total. All rooms are en-suite, with stylish Italian bathroom fittings, solar-heated water and a canvas front that can be opened up if you want a shower with a view. Bedrooms are very large and have folding doors which open onto private decks with views of the waterhole. You have solid wooden furniture, cedar beds, leather armchairs, Persian rugs and African art. Rooms are imaginatively named and you may find yourself in the Artists Studio, Natural History Villa, Love Shack, Photographers Studio, Literary Room or Observatory. The lodge has 24 hour power and batteries can be charged in your room. There is also a private villa, Nyati House, available for exclusive bookings, situated close to the main lodge. 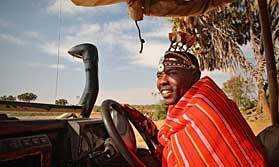 Activities: The lodge offers game drives and guided bush walks, all led by local, Masai guides. You can also take night drives. This is a good area for bird watching. All guides speak English and Kiswahili. One guide also speaks Italian. You can visit Masai communities. Bush meals and sundowners can be arranged. Additional activities available at extra cost include balloon flights, scenic plane rides and visits to the rhino sanctuary. Saruni offers a 'warrior for a week' programme, when you are taught survival skills and trained like a junior warrior, learning how to make tools and track animals. Facilities: The dining area is named Kuro house and has a large fireplace. There is a strong Italian influence evident in the cuisine, with risotto and pasta on the menu. Ther lodge has a library with a selection of books. The spa, named the Masai well-being space, offers a range of treatments, set in a secluded cottage in the forest. Specialities include pre- and post-game drive massages. Dining: Meals are taken communally with other guests, guides and camp managers, though private in-room dining can be arranged. Children: Children of all ages are welcome. There is a family villa and baby-sitting can be organised. Communication: All rooms have internet access and there is a laptop in the office for guest use. There is a mobile phone signal. Notes: The lodge accepts cash in US Dollars, Euros, Sterling and Kenyan shillings. Travellers cheques, Visa, MasterCard and American Express credit cards are accepted. The lodge does not accept debit cards. Saruni Mara & Saruni Wild - Stay 3 nights and get an extra night free. Valid for each property and for the 2 in combination. Valid for stays from now till 20th December 2015. Park fees must be paid for all nights. Saruni Samburu plus either Saruni Mara or Saruni Wild, stay 5 nights and get a 6th night free. Valid for stays from now till 20th December 2015. Park fees must be paid for all nights. Book 4 nights or more for your honeymoon at Saruni Samburu or at Saruni Mara/Saruni Wild - mid & high season. Saruni has established a women's group, whose members come from the local community. The ladies are encouraged to sell their artifacts directly in the Saruni shop and the lodge makes sure that they group remains in charge of the income generated from this activity. Saruni also supports the Kibera Paper project, selling cards in the shop to support HIV-affected single mothers who live in Kibera slum (Nairobi). More than 80% of Saruni's employees are from local communities. Saruni also sponsors young Maasai to train as guides at the Koiyaki Guiding School. Saruni pays park fees directly to the land around the camp. The camp uses solar power to produce electricity and to heat water. "The lodge and the team that run it are excellent. Great quality rooms and excellent food, plus a spa, all combine to make you feel very relaxed. The only downside is the distance the camp is from the plains where you will see most of the wildlife (about 20-30 mins drive), but that's not a big deal and all the guests I talked to here didn't feel that was an issue. "